Nickname: "Chepchik" (bonnet), "Russian Garrincha"
Alumnus of the youth team "Dinamo" Bolshevo labor communes Dzerzhinskiy - 1932-36. Then he played for a club team adult labor communes - 1937-38. First coach Matvey Iosifovich Goldin and Ivan Ivanovich Saykin. The best right winger Soviet and Russian football for all years. Well technically trained, quick, nimble, agile, superb owned a trick, during which subtly changed rhythm and direction of movement. He is so masterfully used fraudulent movement, that defenders fell to ground before direct contact with him, because they lose balance responding to his tricks, performed with such ease and naturalness, that does not believe it was not possible. Moreover Trofimov did all this on different sections of the field, but they are especially effective when he is moved to the side line fields, masterful covering up the ball and never losing his outside the field. Was exemplary master tactical ingenious moves, mastered the art of understanding his partners in attack. He subtly evaluate game situations, instantly take the best decisions on time and very accurately and on time or pass the ball in the best position to partner, or taking the game himself. Completing the attack were exemplary – he has done or acute, passing from side always intelligent and technically impeccable, or beat attack on goal, power point and conform to, or position of goalkeeper quietly in the corner, or powerfully in the top corner. You can only receive equanimity and richness of the funds. In each movement, each step of this grand art forward visibly has genuine masters and football strategist. Trofimov for his time acted remarkably creative, he never limit his maneuvers only their edge, and acted on the entire field, often switched Centre went away-again in accordance with the prevailing situation is deeply back at their midfielders and often started to attack with his half of the field. Unfortunately, severe injuries forced him to leave earlier than big soccer and prevented many spectators enjoy his unforgettable, perfect games. 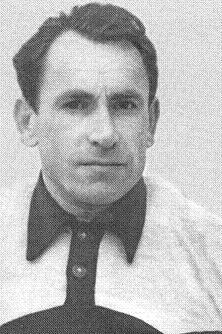 Trofimov, along with Bobrov are unique athletes that honorary title of Honored Master of Sports was given on three sports - football, hockey and bandy. They were equally great in each of these sports. Dinamo Moscow (1939-53) - 288 matches, 100 goals (in total). Captain of the team 1950-51. In All-Stars team championship of USSR - 1943, 1945, 1946, 1947, 1948, 1949, 1950, 1952. In 1967 in a poll of Soviet Union outstanding football experts entered the Team of the USSR for 50 years. In 1952 he participated in the Olympic Games in Helsinki. Played 3 matches, scoring 2 goals. He need changes, some stats did not bother me. STA and TS, very high for a football player of those years, but he was rather distinguished by his starting jerk, which was at the top level. He was not a virtuoso or close to it, he controlled the ball well at high speed, but had a limited arsenal of feints. He acted simply, beating the opponent through good reaction and quick movements. A team player, but as much as the range of his actions allowed, on the flank, all the same, maneuverability and high-speed dribbling are valued, not fighting qualities. He was very aggressive in the attack and caused respect by his intransigence, tenacity, but losing the ball did not pursue the opponent in the long run, there were enough unsuccessful attempts to stop. Delete special abilities: Playmaking, 1-on-1 scoring. Maybe need to change his passing and shoot abilities, but later.